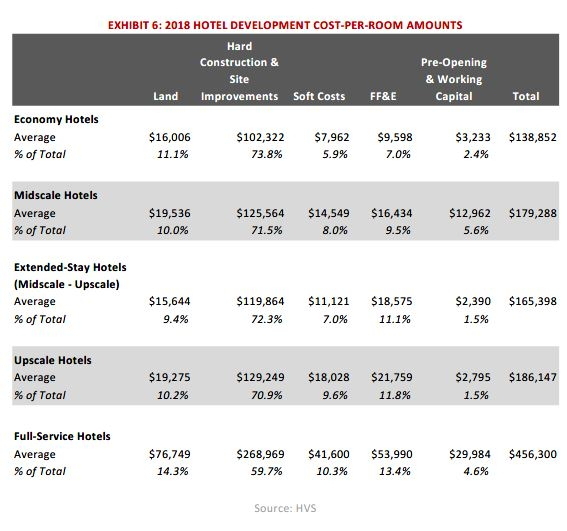 The HVS Hotel Development Cost Survey presents the average development cost per room in each product category. Development costs change from year-to-year, market-to-market, and site-to-site and as such the results are best used as a broad measure of generally applicable metrics or ratios; special consideration needs to be given to specific projects, building materials, and locations. Our goal in sharing this information is to provide developers, appraisers, consultants, and other stakeholders in the market with support for preliminary cost estimates of hotel development projects, as well as to show a cost comparison across the different product categories. 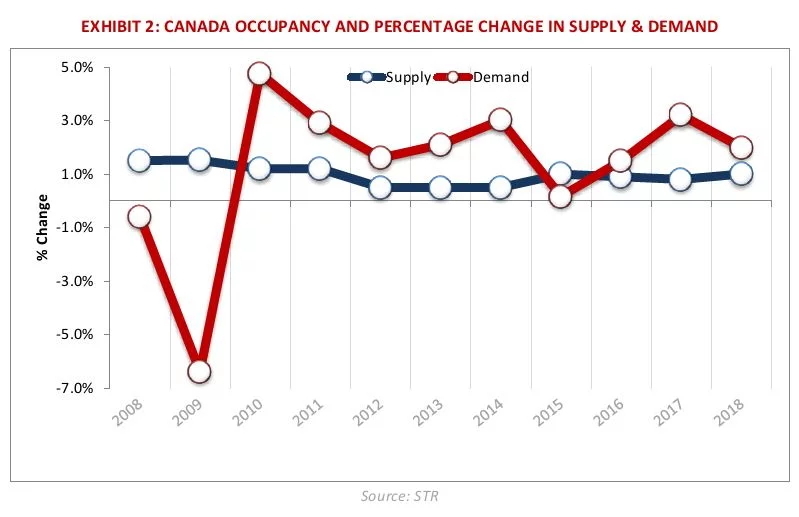 Demand Outpaces Supply Growth Nationally, Continuing to Fuel Positive Hotel Performance According to STR, Canadian Hotels reported a 2018 year-end ADR of $163 and an occupancy of 67%. This marks yet another record year for RevPAR in Canada as it has exceeded the 2008 record of $85 each year since 2013. RevPAR growth reached its fastest clip in 2017 at 7.7%. In 2018, RevPAR growth moderated to a still notable 5.3%. Supply growth over the past decade has been limited across the country and the best-performing markets have significant barriers to entry. 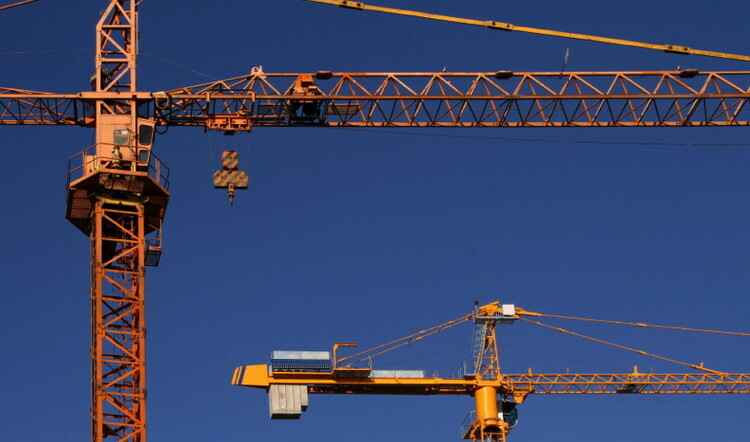 Improvement in top-line performance has not always translated into more proposed supply as operating costs have continued to climb in many markets and competition with other developments has driven up the cost of labour, both construction and operational talent, as well as the cost of the best development sites. Canada is fairly notorious for its long winters and pronounced seasonality, both of which have limited the markets’ ability to dramatically grow occupancy. Many markets, fortunate to have significant unaccommodated demand during peak periods, are now pushing room rates higher, which has resulted in significant RevPAR increases since 2013. Hotel Development Cost Categories The Uniform System of Accounts for the Lodging Industry (USALI) provides industry participants with a common language for analyzing the financial performance of a hotel. However, a consistent format for development budget is sadly lacking. As consultants preparing feasibility studies and as appraisers developing opinions of value for construction financing, we have reviewed hundreds of hotel development budgets. We are often asked for input on hotel development budgets and find that a lack of common language for identifying relevant cost items is indeed a challenge for industry participants. Land Oftentimes, the dollar amount of land in a development budget can be based on actual acquisitions, appraised value, or as equity contributions by parties to the deal. For many projects, the land may have been acquired several years prior to the development. When evaluating the feasibility of a project, the land cost is most relevant when it is an actual acquisition price or is based on the “as is” market value of the site. Pre-Opening and Working Capital Operating reserves, pre-opening, and marketing costs are important items to include in development budgets. Sometimes these costs are omitted from the budgets that we review and are amortized in the profit and loss statements instead. It is critical to acknowledge these costs as part of the potential feasibility of a new hotel. Our hotel development cost categories are not meant to be all-encompassing but to reflect the typical items in a development budget. In construction accounting, development budgets are generally presented in far greater detail than for general investment analysis. For the purposes of considering the overall feasibility of a proposed hotel, we find our hotel development cost survey categories to cover the major components of hotel construction costs. Nonetheless, individual accounting for specific projects can still be affected by tax implications, underwriting requirements, and investment structures. 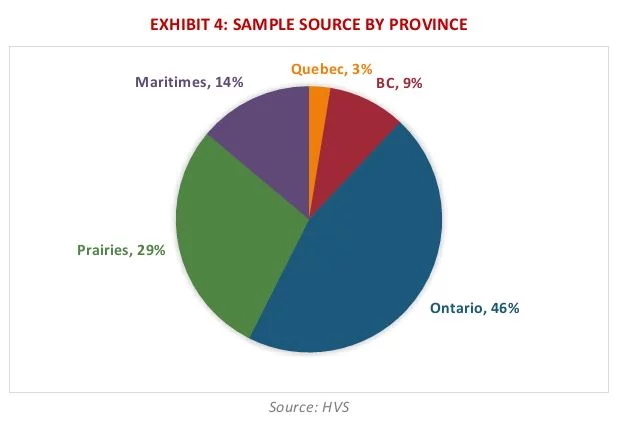 Data Collection and Sample Size In 2018, HVS collected actual hotel construction budgets across all ten provinces in Canada. While not every construction budget was included (due to a variety of reasons, including incomplete data, skewed data, or unique development attributes), the construction budgets sampled span the country and are from 2015 to 2018. Construction costs vary greatly in different parts of the country and each development is different. In this sample, the highest development costs per key were recorded in Fort McMurray. Given the strength of this market, when these developments were underwritten as one of the top performers nationwide, the developers made a conscious decision to proceed as the performance in the market supported the investment decision at that time. Whereas in most other markets, the same development costs would have been value engineered or the project been abandoned. Not surprisingly, the next highest development costs were in major cities with strong fundamentals and high barriers to entry, such as Vancouver and Toronto. The lowest costs per room were evident for economy hotels in highway-adjacent or tertiary markets. We also examined the chain scale breakdown of our data set against the national data from STR. According to STR, nearly 30,000 rooms and 250 hotels are in the planning stages. 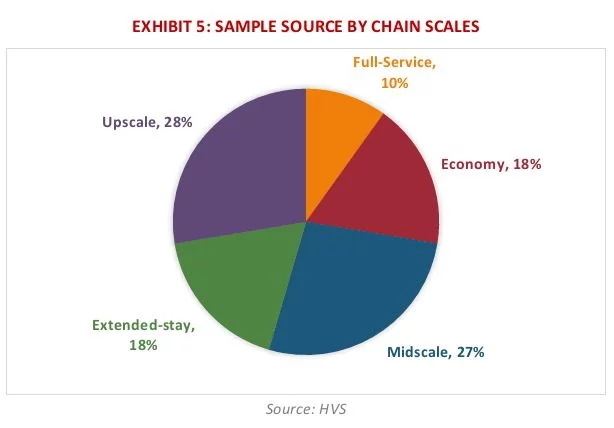 Our sample is generally in line with the STR’s national figures for breakdown by chain scale, with midscale and upscale hotels being the top two segments. Per-Room Hotel Development Costs As noted previously, this is the first year HVS Canada has published a Hotel Development Cost Survey and we have included five development cost categories. The averages in Exhibit 7 reflect a broad range of development projects across Canada, including projects in areas with low barriers to entry and in higher barrier to entry markets that include urban and resort destinations. The totals for low and high ranges in each cost category do not add up to the high and low ranges of the sum of the categories. None of the data used in the survey included a project that was either all at the low range of costs or all at the high range of costs. The total costs shown in the preceding table are from per-room budgets for hotel developments and are not a sum of the individual components. Conclusion The budgets analyzed in this survey were provided directly by developers and owners in 2018 and reflect new hotel openings from 2015 to 2018. The survey combines the data from actual construction budgets organized across five product categories with a diverse geographic representation, various building materials, and varying chain scales.